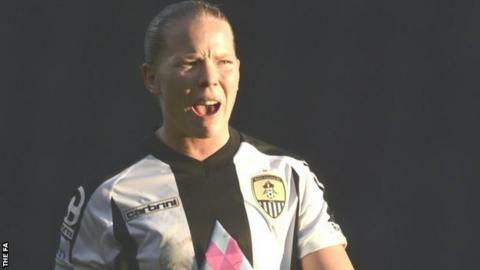 Notts County midfielder Danielle Buet says winning the FA Cup remains the pinnacle in the domestic women's game. Notts County face Everton, the only second-tier side left in the competition, in the semi-finals. While the Lady Magpies are among the favourites for the Women's Super League One title, Buet insists this year's FA Cup final - the first to be held at Wembley - is impossible to ignore. "What else could you really want to do this season?" Buet, 26, told BBC Sport. "The FA Cup has already been really special, it is one of the highest honours you can get. "Especially in women's football, it is on TV and has always been on TV and it is played at big stadiums and now it is at Wembley. If the Lady Magpies reach the FA Cup final at Wembley on 1 August it will be the first time they face top-flight opposition in this year's competition. So far they have beaten third-tier side Tottenham, Women's Super League Two side Aston Villa and are up against another WSL 2 outfit, Everton, in the semi-finals. Notts County or Everton will face either Chelsea or Manchester City at Wembley. "It shows where the women's game is going. We would never, in previous years, have been able to play at Wembley and this is our opportunity. "The ultimate goal is Wembley - come on, it's the same place the men are playing and that is pretty awesome." England international and ex-Arsenal player Buet was part of the Chelsea side that lost the 2012 final to Birmingham City on penalties at Ashton Gate. "At Arsenal we used to win them year in and year out, so I used to see girls go up and get their trophies and I thought to myself that one day I would love to do that," said Buet. "I was fortunate enough to get to the final with Chelsea where we unfortunately lost on penalties and that was gutting. But you get a taste for it." Everton, the only former winners left in this year's FA Cup, beat the Lady Magpies at the same stage of last year's competition. It is the third successive year that Notts manager Rick Passmoor has guided a side to the last four, having reached the semi-finals with Lincoln City in 2013 before the club changed names and relocated to Meadow Lane before repeating the feat last term. "We have been a semi-final team for a couple of years and we have to take another step forward," Passmoor said after Sunday's 5-1 quarter-final win over Aston Villa. "Last year we didn't deliver on the day and Everton, rightly so, won that game, so we have to make sure that doesn't happen again and that we are firing on all cylinders."